We love Dora in our house – I mean what little girl doesn’t? She always has a fun, learning adventure! My son has had a few adventures himself! He’s been involved in baseball for years and the school chorus for the past 2 years. Being a part of chorus means performing in front of the whole school and parents! Here is a photo of Hunter at the town’s amphitheater! He was so excited and maybe a little nervous about doing this performance. It was outdoors and anyone could attend. He practiced his songs at school and at home for weeks! The children had to help decorate too! 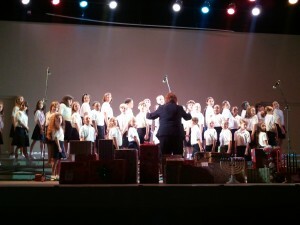 I was a very proud mama that night! 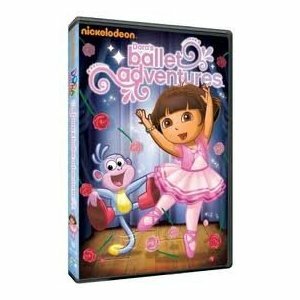 Dora’s Ballet Adventures features 4 fun-filled episodes. In the first episode, Dora must find her ballet slipper before the dance recital begins. Then you can help Dora and Boots lead a parade. What a fun episode that one is! Have a party at the silly fiesta and celebrate Boot’s birthday with a surprise party!! Both of my children sat down to enjoy Dora and Boots! What a great DVD. Entertainment and distributed by Paramount Home Entertainment, is now available on DVD nationwide! You can purchase this DVD on Amazon or Nick.com. I received a copy of this DVD to facilitate this review.My Opinions are my own. I totally loved this dvd! My children love Dora! I’ll have to pick this one up.